Growing up, I was a nightmare to raise – stubborn, mischievous and temperamental. Mum and I never saw eye to eye on a lot of things. I only started to see her point over the last 2 years or so. These days, we would meet up once a week for some bonding time; something we hardly did when I was younger. I introduced her to Senjyu in Bangsar Village II early this year and since then, we’ve been eating there on a weekly basis. The food is good and prices are affordable, and it’s just 10 minutes away from home. Triple plus points! Speaking of affordable, I was given a sneak preview of Senjyu’s Mother’s Day Lavish Indulgence Set; a hearty 4-course meal for RM60++ per person. Lavish Treasure was an appetizer of fried breaded oyster and a triple-layered composition of smoked duck, foie gras and potato salad. 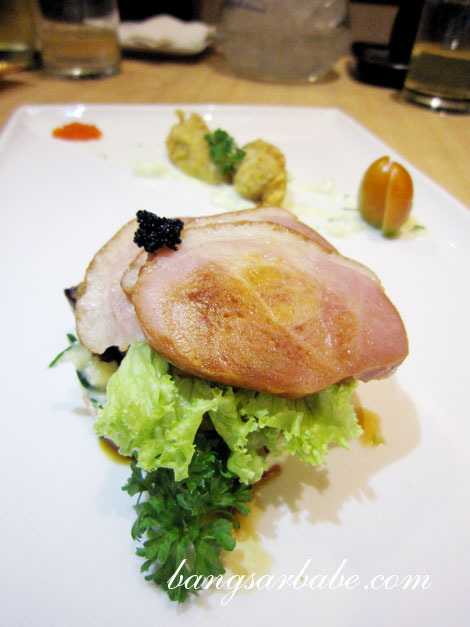 The duck – laced with smoky-sweet aroma – was lightly gamey and rimmed with a layer of flavourful fat. I especially enjoyed the foie gras; crisp around the edges but meltingly tender within. 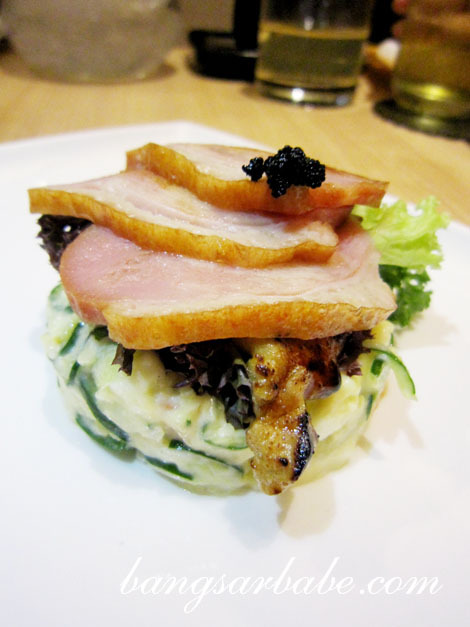 Fois gras and smoked duck is a common pairing, but the potato salad gave it an interesting twist. 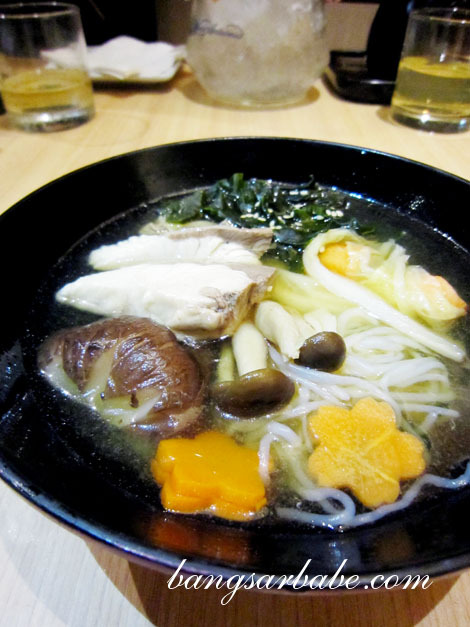 Next was the Hearty Bliss – udon soup with yellowtail fish, mushrooms, tofu and snow crabstick wrapped with cabbage. 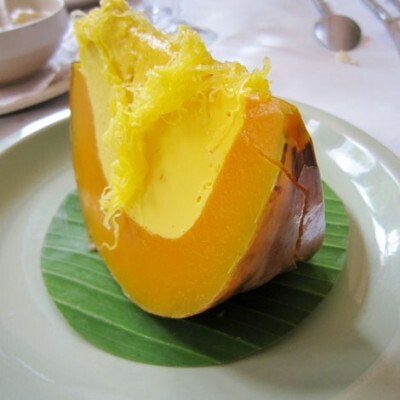 The soup was clean and clear, allowing the flavour of the ingredients to stand out. It’s best to eat the fish first to prevent it from being overcooked in the hot broth. 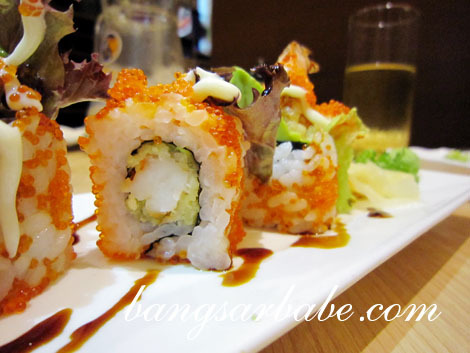 The main course was named Perfect Love and comprised a compact creation of chef’s special prawn tempura maki and salmon and mushroom tempura. 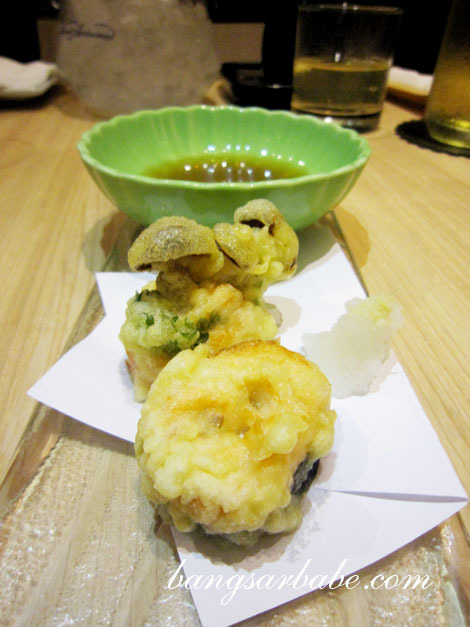 The prawn tempura was lightly battered, wrapped in sushi rice and and coated with roe. Good stuff. Perfectly fried, I enjoyed the mushroom tempura better than the salmon. With every purchase of 2 sets, you get a complimentary dish: Eternal Splendour, a sushi platter of tuna, salmon, butter fish and flower oshinko maki. All freshly made and fine but my favourites were the salmon and butter fish. Both had a smooth and creamy texture. I also liked that the rice was firm and justly flavoured. No wasabi or shoyu was needed for this. 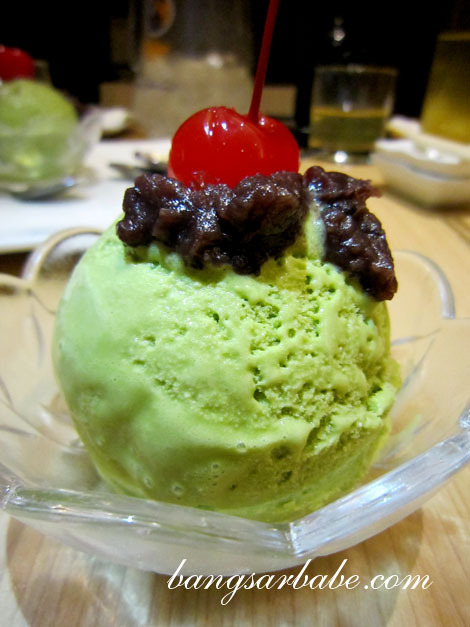 Dessert was the matcha ice cream with red beans and a maraschino cherry on top. This boasted a good balance of matcha and cream. Simple stuff, but it was a good end to the meal. If you’re looking for a place to take your mum to this Mother’s Day, give Senjyu a shot. I’m definitely taking my mum here for this! The Mother’s Day Lavish Indulgence Set is available from 5th – 20th May 2012 at Senjyu Bangsar and Senjyu [email protected]. The set is available throughout the day for the Bangsar outlet. For [email protected], the set is available throughout the day during weekdays and only for dinner on weekends. Do call ahead to make a reservation. Bring her try la. They have a good wine list too! My mum also loves Japanese food…. am thinking of bringing her for Jap but not sure which restaurant yet.